The dental field is constantly evolving, finding new ways to improve results, bolster patient comfort, and speed up treatment plans. 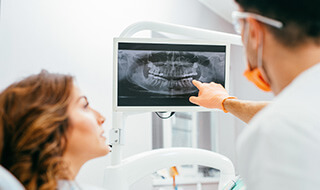 At Collins & Montz Dentistry, we’ve invested in plenty of state-of-the-art tools and techniques so that your appointments are always the best they can be from beginning to end. Our Melbourne Beach, FL office is open to whole families and patients of all ages – contact us today to schedule your visit with a friendly and caring team that can’t wait to exceed your expectations! Dr. Collins and Dr. Montz look forward to getting started. 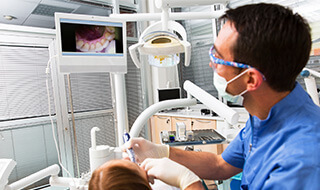 With an intraoral camera, it’s easier than ever for patients to see what our doctors are seeing during each and every exam! This camera-tipped wand is inserted comfortably into the patient’s mouth, and within seconds, high-resolution images are transferred to a monitor conveniently placed in the room. This helpful visual aid gives us the power to directly point out areas that may need a little extra attention in your oral hygiene routine and explain the effects of certain treatment options with more clarity. Today, X-ray technology has come a long way from darkrooms and lightboxes. 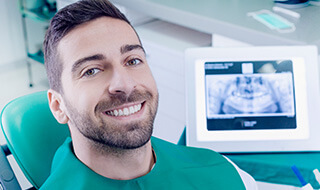 At Collins & Montz Dentistry, we’re happy to utilize digital radiography that can capture these necessary images quicker and safer than their traditional counterparts. Our doctors and team members can even magnify and color-code them to aid both our and our patients’ understanding! Better yet, the amount of radiation exposure is greatly reduced, which is good news for children and adults alike. When planning complex treatments like dental implant placement, it’s important to our Melbourne Beach, FL staff that we have the full picture. 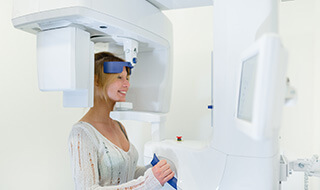 That’s why we utilize our state-of-the-art cone beam scanner to create three-dimensioning, comprehensive imaging of the patient’s mouth, jaw, and related facial structures. By being able to view even the smallest details – including the placement of certain nerves, sinuses, and more – in perfect clarify, we can ensure exceptional preciseness and highly successful results! With a soft tissue laser, treatments like periodontal disease therapy and aesthetic gum recontouring are simpler and more comfortable than ever before. The focused wavelength helps our team eliminate unnecessary tissue in the most precise fashion possible, providing instant sterilization so that any bleeding or other post-operative symptoms are minor. Many patients don’t even require any anesthetic during the procedure!